Pears are really cheap here at the moment, so I bought a couple of kilograms of Josephine dessert pears a week ago. Lots of eating out has meant that I haven’t used them as quickly as I thought and they’re now all ripening at once in the fruit bowl. To use them up quickly, I poached them in a vanilla syrup, which I then reduced to a caramel with some orange zest and salt. The syrup is a nice combination of sweet, fruity, bitter and a tiny bit salty. I served them with some coconut yoghurt and chopped roasted almonds for a textural contrast. Increase the heat and reduce the syrup until it starts to colour and thicken slightly, taking care not to burn it. Add the orange zest and the salt and reduce further, tasting as you go until you are happy. Just be careful it will be be VERY HOT. 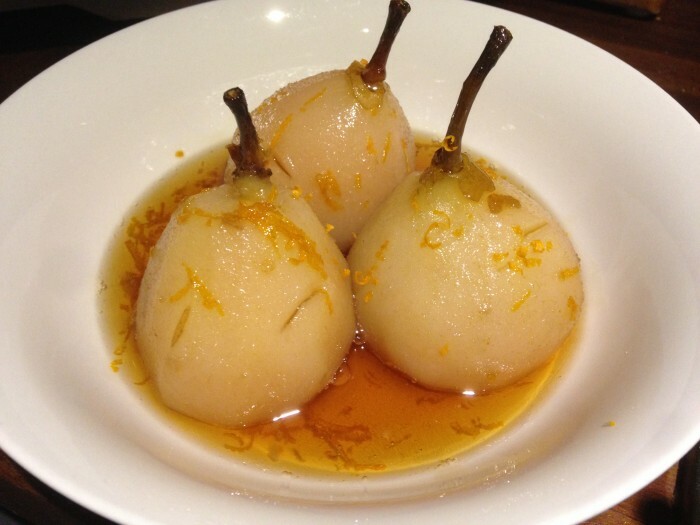 Pour over the pears and allow to cool before serving. The salt might seem odd in a sweet dish, but it does lift the syrup from being cloyingly sweet.